OSG does not operate tools with nuclear sources! All tools are rated for 150 °C/80 MPa, except for the televiewer (125 °C), borehole geophones (135 °C), and fluid sampler (180 °C). All can be used in hole sizes as small as 75 mm. 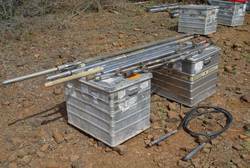 The maximum borehole size differs for each tool. These tools are best run on our special slimhole logging winches but can also be run on any logging winch system with at least a 4-conductor cable.